CADSharp is pleased to present its second product offering: the SOLIDWORKS PropertyManager Page Sandbox. The PMP Sandbox lets you easily generate the code needed for PropertyManager Pages (PMPs) using an intuitive WYSIWYG editor, much like you would use in the VB Editor or Visual Studio. Available for VBA, VB.NET, and C# and compatible with SOLIDWORKS 2014 and later, the PMP Sandbox will massively cut down on the time it takes you to create a PMP for your macro or addin. Have any feedback for us? Let us know in the comments below or shoot us an email! Want to keep up with new CADSharp products like PMP Sandbox? Sign up for our newsletter! Getting Serious with the SolidWorks API – Tuesday, Feb 6, 10:30 AM – 12:00 PM – Have you hit a ceiling in your API skills? Is your code a patchwork of recorded macros and other peoples’ code? Can you barely make sense of most API code? Using live examples, this session will take you take control of your code by demystifying the SOLIDWORKS API Object Model and the API Help. Write a SolidWorks Addin From Scratch – Monday, Feb 5, 10:30 AM – 12:00 PM – Curious how professional developers create add-ins from the ground up? This hands-on session, which assumes attendees have at least a basic knowledge of object-oriented programming, will walk through DLL registration, hooking into SOLIDWORKS, menu creation, and debugging in Visual Studio. Visit Our Exhibit Booth for Macro Mania! Please visit us at Partner Pavilion booth 533, which is located in directly in the back of the hall near Model Mania. Our exhibit will feature customer case studies, upcoming product demos, and our own “Macro Mania”! The latter gives you opportunity to test your skills at writing a macro from scratch using only the SolidWorks API Help for reference. Top three finishers will receive an Amazon gift card. Even if competition isn’t for you, please stop by to have a chat and learn about our upcoming products and events. For example, we will be unveiling “PMP Sandbox”, which is a tool that allows you to quickly generate PropertyManagerPages code (VBA, VB.NET, or C#) using a GUI. If you have any interest in meeting with our Technical Director, Keith Rice, to talk about your automation needs, please email him and he’ll make sure he’s at the CADSharp booth at that time. Thanks and see you in LA! 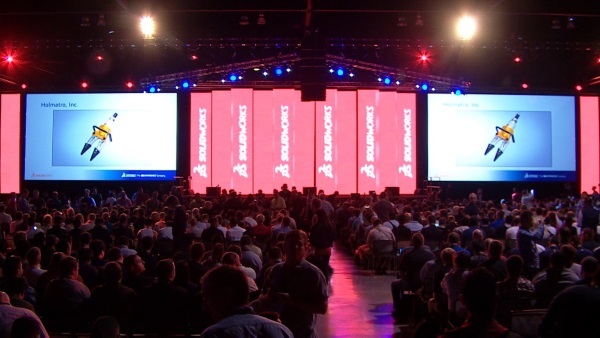 Want to keep up with future content, training, and events like SolidWorks World? Join our monthly newsletter! One of the most valuable benefits of a CADSharp.com Power User membership is the on-demand technical support (SolidWorks API and SolidWorks PDM API) we provide to our customers. Previously this technical support was available only via email. As of today, we are now giving customers the option to ask questions and start discussions in CADSharp’s Slack. Below I’ll explain what this is and why you might consider using it. Slack is a communication tool that tries to take the best elements of email, Facebook, and forums and roll them into one. Companies use it so that its employees, contractors, and customers can communicate more efficiently. Communication occurs mostly in public or private “channels”. Private channels can only be seen and used by people specifically invited to those channels, whereas public channels can be seen and used by anyone in that Slack community. A Slack account is free and can be used via web browser, desktop client, or mobile app. Personally, I prefer the desktop client, which I can hide in the Windows system tray while it is running. Why use our Slack instead of email? 1. Every CADSharp.com team member can instantly see your issue. As a result, you’re going to get help MUCH more quickly than if the issue must be funneled through me first. 2. You can see and search the history of all CADSharp tech support inquiries. This means that the entire CADSharp.com community is benefiting from everyone else. 3. Uploading images, files, and code snippets is MUCH easier through Slack than through email. Trust me, you’ll fall in love with the user interface. No more worries about file attachment size or email destroying your code’s formatting. 4. Slack keeps discussions organized in threads, just like in a forum. No more archiving messy email chains or accidentally deleting or losing the info you need. What happens when my Power User membership expires? Nothing, actually. We don’t kick you from our Slack, we just ask that you refrain from creating new questions and discussions until you renew your membership. You can still respond to other people’s questions, of course. You’ve no doubt heard the saying, “Too good to be true.” We’re proving that adage wrong right now and we’re incredibly excited about it. Join hundreds of other satisfied Power User members today and start getting on-demend tech support from the best SolidWorks API minds in the world! Want to keep up with new training events, blog posts, code snippets and more? Sign up for our newsletter.